"	In 1878, the three Muldie brother-ages eleven, eight, and three-and their father travel from Kentucky to Nicodemus, Kansas. Living in a dugout like other black pioneer families, they endure hunger and hardships before spring comes. 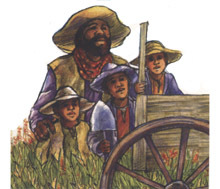 Ed Muldie leaves the boys to take care of each other while he looks for a better homestead further west. They hunt, fish, and stay in the dugout until their father's letter arrives months later with a rough map. Following the Solomon River, they make the 150-mile journey. Their courage and resourcefulness keep them safe and bring them to their father. Based on actual events, Barbara Brenner's tale (Harper, 1978) is told by Johnny, the oldest boy. Steven Michael Harper gives all the characters distinctive voices. His slow, expressive reading gives weight to the simple sentences of the text and allows youngsters to follow along. Sound effects-prairie winds, water in the creek bed, the sound of horses and the banjo music-all make life on Kansas prairie very real. Page turn signals are optional. This exceptionally fine production raises a significant piece of historical fiction to a very high level."